This population-based case-control study aims to verify the risk factors associated with preterm birth (PTB) in a maternity school. The cases were newborns with a gestational age greater than or equal to 22 weeks and less than 37 weeks (birth weight greater than or equal to 500 g), and controls were those born with gestational age equal to or greater than 37 weeks gestation. Data are recorded in the Live Birth Information System of 3,915 births at the Januário Cicco Maternity School in the year 2017. Pearson's chi-square test was used in conjunction with the adjusted residuals analysis and a hierarchical logistic regression analysis to verify the predictive variables of PTB. The variables were placed into a hierarchy and grouped into sociodemographic variables, reproductive history, and gestational and birth factors. A total of 976 cases and 2,377 controls were allocated for the analyzes, approximately (1:2.5). None of the maternal sociodemographic variables presented enough relation to prematurity to be inserted into the regression model. The model containing the variables of reproductive history shows that an obstetric history of up to two previous vaginal deliveries was related to PTB [X2 = 24.450; p < 0.001, R2 Cox and Snell = 0.007]. The model containing the variables of gestational factors, as multiple pregnancy, was the one that best explained prematurity and presented a determination power of 6.7% [X2 = 232.8; p < 0.001, R2 Cox and Snell = 0.067]. Multiple gestation, inadequate prenatal follow-up, anomalous presentations and obstetric history of up to two vaginal deliveries are risk factors for PTB. All infants who were born between 22 and 37 weeks of gestation are considered preterm or premature. Annually, about 15 million premature babies are born worldwide, of whom one million die due to complications , making this the main cause of infant mortality for infants below the age of 5 years in 2015 . Prematurity is a global problem and Brazil is among the top ten countries with the highest number of preterm births. In lower income countries, on average 12% of infants are preterm, compared to the rate of 9% in high-income countries . This condition can also have several morbid consequences for newborns, with motor and cognitive, visual, behavioral and growth problems being reported in the literature, which makes the investigation of the factors leading to preterm delivery extremely relevant . In addition, it represents a challenge to public health and is of economic importance for society because it requires highly complex care in the neonatal period or even, depending on the case, for a lifetime . Prematurity is classified into two categories: Spontaneous, a consequence of spontaneous labor or premature rupture of membranes, and iatrogenic, when it occurs by medical recommendation, due to maternal and/or fetal complications. Data from the study "Birth in Brazil" which used a national population-based sample of 23,940 women showed a preterm birth rate of 11.5%, being 60.7% spontaneous and 39.3% iatrogenic, with more than 90% of the last group being pre-delivery caesarean . The scientific literature portrays certain sociodemographic and clinical factors as more prevalent and determining for a negative gestational outcome: Extremes of reproductive age, low pre-gestational weight, use of substances such as tobacco and alcohol, low socioeconomic status, being single, lack of education and stress during pregnancy are associated with an increase in the rate of prematurity . A multicenter cross-sectional study of preterm births in 20 Brazilian referral hospitals identified that two-thirds of preterm births were spontaneous and indicated that multiple pregnancies, previous preterm birth, cervical insufficiency, vaginal bleeding, fetal malformation, polyhydramnios, inadequate prenatal care, previous miscarriage and urinary tract infection are all factors independently associated with spontaneous preterm birth. The overall prevalence of preterm infants was 12.3%, varying between 11.1% in the Southeast and 14.7% in the Northeast. Only 7.4% of preterm births occurred before 28 weeks of gestation, while almost 79% occurred between 32 and 36 weeks . The complexity of the prematurity and the fact that the overlapping factors are not yet well established, justify further studies being undertaken for a better understanding of the risk factors associated with premature delivery. This research aims to demonstrate the risk factors associated with preterm birth in a Brazilian maternal and child health hospital. Case-control study. The data came from records of births at the Januário Cicco Maternity School (MEJC) in the municipality of Natal/RN, Brazil, which appeared in the database of the Information System on Live Births (SINASC), for the year 2017, provided by the Hospital Epidemiological Surveillance Center of the maternity ward. The cases were preterm infants with a gestational age of less than 37 weeks, and the controls were full-term infants with a gestational age at or above 37 weeks. We included records of newborns with birth weight greater than or equal to 500 g and/or gestational age greater than or equal to 22 weeks. The newborns that were excluded were those who were registered without any of the variables under study. In the study year there were 3,915 registered births of living children. Of this population, 2,759 were of full-term birth and 1,156 were of premature birth. Of this population, 382 were excluded among the full-term births and 180 among the premature infants, due to lack of registration of any of the variables under study. The study sample consisted of 3,353 newborns, 976 in the preterm group and 2,377 in the full-term group, giving an approximate proportion of (1:2.5). Prematurity was considered as a dependent variable. The independent variables included in the analyses were sociodemographic variables, reproductive history and gestational factors. Sociodemographic variables were stratified into age, cohabiting with companion, maternal level of education, race/color. The variable maternal education was categorized as adequate and inadequate for maternal age, according to the last year of study completed. The variables of reproductive history were stratified into number of living children (none; 1 to 2 children; 3 or more children), number of fetal losses/miscarriages (none; 1 to 2; 3 or more), and number of previous pregnancies (none; 1 to 2; 3 or more). The variables of gestational factors were stratified into type of gestation (single; multiple), prenatal (adequate; inadequate), induction of labor (no; yes), fetal presentation (cephalic/breech/shoulder) and type of birth (vaginal; caesarean section). The prenatal variable was categorized according to the number of minimum prenatal consultations recommended for the gestational age of the birth, so it was considered adequate prenatal care when the woman had four or more consultations at 37 weeks. The variables were hierarchical following a model of determination of prematurity. At the first level, the sociodemographic variables were grouped. At the intermediate level, the variables of maternal reproductive history were grouped, and at the third level, the gestational and birth factors were grouped. In order to compare the proportion between preterm and full-term groups, the Pearson chi-square test was used on the predictor variables in conjunction with the adjusted residuals analysis. A hierarchical logistic regression analysis was used to verify predictors of prematurity. The criterion for the entry of the variables in the model was to show significance of association of p value < 0.10 in the crude analysis. Odds Ratio (OR) and their respective 95% confidence intervals were presented. The coefficient of determination (R2) of Cox & Snell was used as the explanation percentage of the model. The analyses were done through the software SPSS Statistics Base 22.0. The institutional research ethics committee approved the study. A total of 3,353 newborns, 976 in the preterm group and 2,377 in the full-term group were included. Mean gestational age of full-term births was 38.7 ± 1.2 (minimum and maximum of 37 to 44) and of premature infants was 33.8 ± 2.8 (minimum and maximum of 22 to 36). The mean birth weight of full-term was 3,279 ± 528.7 g and the preterm was 2,301 ± 692.9 g.
In the analysis comparing the proportion between the preterm and full-term groups there was no difference in the variables of maternal sociodemographic characteristics. In the variables of maternal reproductive history, specifically, previous vaginal and caesarean section deliveries, there was a difference in the proportions between the premature and full-term groups. A higher proportion of preterm infants were found in mothers with a history of 1 to 2 previous vaginal deliveries, and a higher proportion of preterm infants were found in mothers without previous caesarean section (Table 1). Regarding variables of gestational factors, there was a difference in the proportion between the preterm and full-term groups, specifically in the type of pregnancy, prenatal care and fetal presentation (Table 2). A higher proportion of preterm infants were found in multiple pregnancies, inadequate prenatal care and anomalous presentations. Table 3 presents the results of the binary logistic regression. None of the maternal demographic variables presented enough relation with prematurity to be inserted in the regression model. In the model containing the variables of reproductive history, an obstetric history of up to two previous vaginal deliveries was related to preterm birth [X2 = 24.450; p < 0.001, R2 Cox and Snell = 0.007]. However, the power of determining the prematurity of variables of maternal reproductive history was very low. A history of 1 to 2 previous vaginal deliveries increases the chance of prematurity by 23%, while a history of 1 to 2 previous caesarean sections reduces the risk of prematurity by 30%. The model containing the variables of gestational factors explained 6.7% of prematurity [X2 = 232.8; p < 0.001, R2 Cox and Snell = 0.067]. Multiple pregnancies increase the chance of prematurity by approximately 5.5 times and inadequate prenatal care 2 times. The chance of caesarean section was 34% lower in the preterm group. Preterm infants present 3 times more chance of anomalous birth presentation (Table 3). The most important results of this study were found among the variables of gestational factors, which demonstrated that the prematurity is associated with multiple pregnancies and with inadequate prenatal care. Multiple pregnancies have been indicated as a risk in many studies [5,6,8-10] and in this study the risk was increased by approximately 5 times. In a Brazilian multicenter study, the factor that showed the highest odds ratio for prematurity was multiple gestation . Another study conducted in Brazil found a twin's prevalence of 12.2% among preterm births and only 0.5% among controls . The high rate of spontaneous preterm births of twins is explained by uterine overload, resulting in contractions and/or premature rupture of membranes . Inadequate prenatal follow-up increased the chance of a preterm newborn by 2-fold. We considered adequate prenatal care if there were four or more visits before 37 weeks, although currently the quality of prenatal care and how adherence is obtained appears to be much more important than the number of visits. Indeed, some studies have shown that the prevention of preterm birth is linked to availability, adequacy and access to prenatal care, which is able to track the conditions leading to preterm birth . Poor prenatal care has been consistently associated with increased risk of preterm labor [5-7,9,10,13-17], but retrospective studies cannot be adequately controlled for adjustment to confusing factors and randomized trials (without prenatal care versus standard treatment) would be unethical. Therefore, the only well-designed studies on the effect of prenatal care on prematurity compare standard care with improved care. A meta-analysis that included three trials involving 3,400 women demonstrated that there is no clear evidence that prenatal clinics reduce the number of preterm births . Anomalous presentations were 3 times more prevalent among preterm infants in this study. Some authors also mention shoulder or pelvic presentations as a risk factor for preterm delivery [12,13]. This finding, however, may not be a real risk factor for preterm delivery, but a result of the course of a normal gestation that has been interrupted prematurely since the fetus can still move throughout the gestation, approximately up to 36 weeks, and assume the cephalic position later . In the study, a previous history of one or two previous vaginal births increased the chance of preterm birth by 23%. This can be understood from the assumption that a reproductive history of spontaneous preterm birth in previous gestation is the main risk factor for recurrence [19,20], and that there is a natural tendency for vaginal delivery by the spontaneous characteristic of the outcome. With this reasoning, it is also possible to explain the relationship of a previous history of cesarean sections to reduce the risk of prematurity by 30%. For the variables of maternal sociodemographic characteristics, our data did not show statistical relevance, suggesting that maternal age, cohabiting with a partner, level of education and ethnicity of the woman had little influence on prematurity. Data from the literature, however, show that the rate of preterm infants is higher among adolescents and in extremes of maternal age [5,7,21,22], since prevalence of preexisting chronic diseases and obesity may increase the risk in more advanced ages, while physiological immaturity and socioeconomic factors may increase the risk for adolescent mothers. The influence of the presence of a partner during gestation as a protective factor has also been reported, with single mothers being more vulnerable to preterm delivery, as well as the connection of low educational level with an increase in the frequency of preterm birth [5,7,22]. We must highlight as a limitation of this study the use of information from the database, dealt with by several health agents and the lack of important information for a complete analysis, including data on maternal pathologies that may be associated with prematurity. An example of maternal pathology associated with preterm delivery not reported in the researched database was prematurity in previous pregnancies. Moreover, the methodology itself, with a retrospective analysis of the data, limits the search for more direct relationships with the problem in question. Despite the limitations, multiple gestation, inadequate prenatal follow-up, anomalous presentation, as well as an obstetric history of up to two vaginal deliveries are determinants for premature birth. World Health Organization (2018) Preterm birth. WHO, Geneva. Liu L, Oza S, Hogan D, Chu Y, Perin J, et al. (2016) Global, regional, and national causes of under-5 mortality in 2000-15: An updated systematic analysis with implications for the sustainable development goals. Lancet 388: 3027-3035. Zhang YP, Liu XH, Gao SH, Wang JM, Gu YS, et al. (2012) Risk factors for preterm birth in five maternal and child health hospitals in beijing. PLoS One 7: e52780. Almeida MVL (2007) Prematuridade. In: Chaves Netto H, Moreira de Sá RA, Obstetrícia básica. (2nd edn), Atheneu, São Paulo. Leal M, Esteves-Pereira A, Nakamura-Pereira M, Torres J, Theme-Filha M, et al. (2016) Prevalence and risk factors related to preterm birth in Brazil. Reprod Health 13: 127. Almeida AC, Jesus ACP, Lima PFT, Araújo MFM, Araújo TM (2012) Fatores de risco maternos para prematuridade em uma maternidade pública de Imperatriz-MA. Rev Gaúcha Enferm 33: 86-94. Passini R Jr, Cecatti JG, Lajos GJ, Tedesco RP, Nomura ML, et al. (2014) Brazilian multicentre study on preterm birth (EMIP): Prevalence and factors associated with spontaneous preterm birth. PLoS One 9: e109069. Ahumada-Barrios M, Alvarado G (2016) Risk factors for premature birth in a hospital. Rev Latino-Am. Enfermagem 24: e2750. Madi J, de Araújo B, Zatti H, Rombaldi R, Lorencetti J, et al. (2012) Avaliação dos fatores associados à ocorrência de prematuridade em um hospital terciário de ensino. Rev AMRIGS 56: 111-118. Oliveira L, Gonçalves A, Costa J, Bonilha A (2016) Maternal and neonatal factors related to prematurity. Rev Esc Enferm USP 50: 382-389. Silva AM, de Almeida MF, Matsuo T, Soares DA (2009) Risk factors for pre-term birth in Londrina, Paraná State, Brazil. Cad Saúde Pública 25: 2125-2138. Romero R, Espinoza J, Kusanovic J, Gotsch F, Hassan S, et al. (2006) The preterm parturition syndrome. BJOG 113: 17-42. Huang A, Jin X, Liu XH, Gao SH (2015) A matched case-control study of preterm birth in one hospital in Beijing, China. Reprod Health 12: 1. Abaraya M, Seid SS, Ibro SA (2018) Determinants of preterm birth at jimma university medical center, southwest Ethipoia. Pediatric Health Med Ther 9: 101-107. Freitas P, Araújo R (2015) Prematuridade e fatores associados em Santa Catarina, Brasil: Análise após alteração do campo idade gestacional na Declaração de Nascidos Vivos. Ver Bras Saúde Mater Infant 15: 309-316. Silveira MF, Victora CG, Barros AJD, Santos IS, Matijasevich A, et al. (2010) Determinants of preterm birth: Pelotas, Rio Grande do Sul State, Brazil, 2004 birth cohort. Cad Saúde Pública 26: 185-194. Temu TB, Masenga G, Obure J, Mosha D, Mahande MJ (2016) Maternal and obstetric risk factors associated with preterm delivery at a referral hospital in northern-eastern Tanzania. Asian Pacific Journal of Reproduction 5: 365-370. Whitworth M, Quenby S, Cockerill RO, Dowswell T (2011) Specialised antenatal clinics for women with a pregnancy at high risk of preterm birth (excluding multiple pregnancy) to improve maternal and infant outcomes. Cochrane Database Syst Rev CD006760. Tabile P, Teixeira R, Toso G, Matras R, Fuhrmann I, et al. (2016) Características dos partos pré-termo em hospital de ensino do interior do Sul do Brasil: Análise de 6 anos. Rev AMRIGS 60: 168-172. Esplin MS, O'Brien E, Fraser A, Kerber RA, Clarck E, et al. (2008) Estimating recurrence of spontaneous preterm delivery. 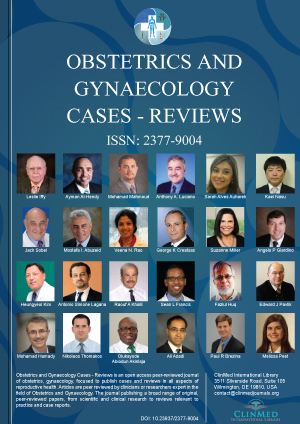 Obstet Gynecol 112: 516-523. Fuchs F, Monet B, Ducruet T, Chaillet N, Audibert F (2018) Effect of maternal age on the risk of preterm birth: A large cohort study. PLoS One 13: e0191002. Haas JS, Fuentes-Afflick E, Stewart AL, Jackson RA, Dean ML, et al. (2005) Prepregnancy health status and the risk of preterm delivery. Arch Pediatr Adolesc Med 159: 58-63. Ricardo Ney Cobucci, Faculty of Medicine, Department of Gynecology and Obstetrics, Potiguar University-UnP, Salgado Filho Av., 1610, Natal, Postal Code 59056-000, Brazil. © 2018 de Medeiros BKB, et al. This is an open-access article distributed under the terms of the Creative Commons Attribution License, which permits unrestricted use, distribution, and reproduction in any medium, provided the original author and source are credited.